An allotment for Bamba for those not attending SDCC would be nice but i'm not holding my breath. That's what I'm talkin' about. I just don't get why the seemingly best figures become exclusives at some con/event,etc. I mean isn't the purpose to have an exclusive is to make new people aware of your company? But what ends up happening by putting out these cooler exclusives is you attract the people who already know about your company and are just going to the event to get the exclusive to flip it later. If you just put out a nice enough exclusive that promotes your company/has your company logo on it somehow, but won't attract the "high selling" flipper, then you won't be inadvertently hurting your company by having your passionate customers buying from flippers instead of you. Makes sense, 3A? I hope you're listening. Just requested cancellation of my initial Andy order. Done. I don't mean to Gripe to the gripers. But wouldn't this be a very simple kit bash to match the exclusive? Toss on a leather jacket and glasses from ebay folks. Done. I am keeping my first order and honestly lets not get over freaked out about this. Ether your going to get it or your going to kit bash. Thats the truth of it all. The comment "Ether your going to get it or your going to kit bash" is a very simple way to look at it. For example, those are not the only options. I wrote a much longer post that filled in all the details of why I feel this way, but I held back. That said, if boardies really can't figure out what the issues are, I'll post it. But frankly, I'd rather just get the refund, liquidate the rest of my collection and forget about 3A. I totally understand the issues of them offering members a first bite then re-issuing that as an exclusive. Seams like a weak approach and I do agree that a Con exclusive should be something that represents the company as a wow factor. It only pissed us all of who had all ready dropped money on a figure then 2 months later to see that we received the weaker release of what it should have been. I get the frustration. Its like a slap in the face to the people who support new figures who think they are getting something complete and special. The kit bash is what we are left with doing since we all ready invested or like you chose a cancelation is ok to. It sorta says slap you back in the face 3A for putting us on a run around with figures. For me, I am just happy to land Andy. There is no one else on the market that has made him and well, I am sucker for popbot. The original should have had the cons accessories : hard to say. The original idea is Andy, and they did that. The con exclusive kit could have been an idea after the fact. The point I take issue is: why does a con exclusive get released to the public before the bamba orders have shipped?? Let's be clear, the bamba orders funded the production of this figure. Not cool at all. 3A, fulfill your orders before you cannibalize the pre-orders. This is what happened. Every con exclusive that sells could have been an order fulfillment from a bamba order. Stop doing that. Con exclusives separate from any pre-order offered on bamba afterwards ; I have no problem. This is what happened at Venture which nullified from a sales point of Venture, but I get it. Everyone was pissed. BTW, I expect all the USA Venture exclusives to be offered on bamba now.. So in short, fulfill your orders before playing with others money. 3a_boltman wrote: For me, I am just happy to land Andy. There is no one else on the market that has made him and well, I am sucker for popbot. 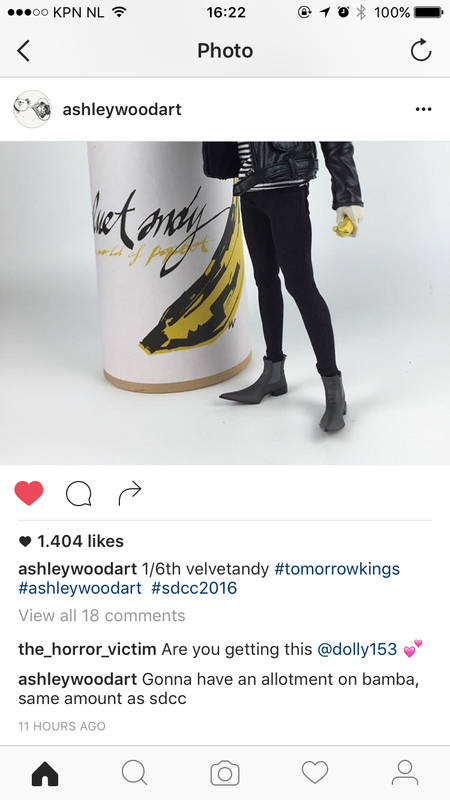 FWIW, Medicom did two great 1/6 Warhol figures years ago, if that's what you're referring to. PS: Still waiting for a response to my e-mail to CS about getting a refund for my original Andy order. Velvet Andy TK Bambaland allotment!!! Well, at least an announcement we'll have a Bambaland allotment. Step in the right direction, for sure. But I don't want two Andys, one of which a) I will have no use for and b) will be impossible to recapture cost of. Hopefully CS refunds my initial order, then I'd try for this one. Also, as a 3AA member attending SDCC I'd rather try to buy this exclusive off bambaland and utilize my discount instead of wasting hours in line to possibly score and pay retail. Strange. I cancelled stuff before and yes you do have to lose 5% to cover PayPal. Also 3a has given con exclusives preference over pre-orders before, the only one that affected me personally was the mighty squaro. And I definitely think it's an insult to the loyal legion but the party line is that's the way it is, love it or leave it. dtrain wrote: Also, as a 3AA member attending SDCC I'd rather try to buy this exclusive off bambaland and utilize my discount instead of wasting hours in line to possibly score and pay retail. Strange. Odds are just as much against you with bamba sale. I'm guessing it will be over in seconds. I wouldn't be surprised if this is one of those sales that doesn't even get announced until they're up. Then all gone in an instant. I for one am pretty happy to see threeA doubled the production size of this SDCC release to give fans from all over the world which are unable to attent SDCC, a change to get their hands on this figure, instead of having to resort to scalpers on eBay. So attending fans also have more chance to score one during SDCC2016 and not see their toys ending up in the bags of people wanting to make a quick profit from their trip to San Diego. I agree with Gar, threea has recently been very attentive to feedback from fans. Thumbs up to all threea staffs who bothers to feedback to their management on fans concerns cheers. gar wrote: I for one am pretty happy to see threeA doubled the production size of this SDCC release to give fans from all over the world which are unable to attent SDCC, a change to get their hands on this figure, instead of having to resort to scalpers on eBay. I'm guessing this. It'll be up and gone before mentioned on any of the 12 different 3A news pages. allow buyers from last year an option to get Andy as originally solicited, or upgrade their previous order to the SDCC version. If SDCC Andy is more $$ than OG Andy, 3A charges the price difference for upgrade. Simple solution and no rotting in SDCC line, hoping you'll catch them at Bamba (esp if flash sale), or dealing with scalpers. Otherwise, if we want the better version, 3A is making more so we are "allowed" to buy it twice; how kind! So happy! And best advantage? Don't need to deal with disposing of lesser Andy no one will want. In my view, if 3A is going to be considerate of their fans, this is the least they could do, especially for people who already paid for them last year. Also, 5% for admin fee is not cost of PayPal fee - when you issue a PayPal refund to a buyer, the PayPal fee is refunded to the seller - 100% clean. That said, may not be the case after 6 months have passed, but that's on 3A. Or just put the order in our hands before making OUR figure for sale to others off the street.